Webmasters are Harry Sherry and Dave Stewart. Members and others wishing to use the website should contact Harry Sherry by e-mail: hsherry@tinyworld.co.uk or by phone 0141 887 5289. There are still some dates to be confirmed. This is the most up to date so far. B-B-Q : 20th May: Maid of the Loch at Balloch. Summer Run & lunch: 20th or 26th August – Precise date and venue to be advised. Bus Run & Afternoon Tea 16th September – venue to be advised. 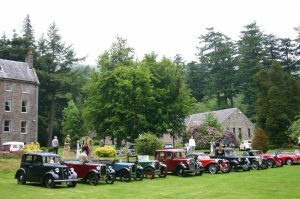 Autojumble 6th October – Lenzie. Christmas/Mid Winter meal. Date to be advised. Annual General Meeting: Date to be advised. I assume I am not alone in becoming frustrated at what seems to be a never ending winter. Here in the wilds of Lanarkshire the gritters are still out most nights so the cars are still in the garage. The season in Scotland is short enough without it being curtailed further by an extended winter. Anyway, the cars are good to go and the weather must turn soon, roll on Drive it Day! I was disappointed that I had no response to last month’s item about “Oily Rag” restorations. The question of restoration or preservation can be controversial and I had hoped to start a discussion. Comments still welcome for future bulletins. Harry Sherry and I visited the Queen Mary, currently berthed at the Science Centre, where she is being prepared for static preservation. We were given a very interesting guided tour of the vessel which included details of her history and the plans for her future. The purpose of this was to assess the suitability as a venue for a club outing and I believe it most certainly is. Our event diary is full for this year but we will consider it for next. Queen Mary was launched from Denny’s in Dumbarton exactly 85 years ago. She was the largest vessel ever built for Clyde service and provided a daily service from Glasgow city centre to communities on the lower firth. After her withdrawal in 1977 she served as a floating restaurant in London for 20 years but when that closed her future appeared very bleak. Thanks to the efforts of a voluntary group, “Friends of T.S. Queen Mary” she has been purchased and returned to her native river. Simply moving her back to Glasgow was a Herculean task and they are now well underway with the restoration which is intended to return her as close as possible to her “as launched” appearance. 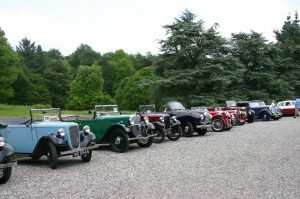 John Young has sent me information on re-run of the 1000 Mile Reliability Run sponsored by Practical Classics magazine. 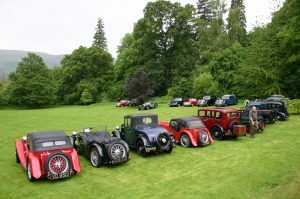 The first 1000 mile Reliability Run was organised by the RAC on 23rd April 1900 in an effort to demonstrate that the motor car was a practical means of transport. Out of 65 starters 35 cars completed the run. The date of the annual “Drive it Day” is set for the Sunday closest to the 23rd in recognition of this. Here is a message from Liz Young who has recently retired from her long standing role as Club Secretary. Liz has done an outstanding job in this respect as well as making a photographic record of events while making sure we were all fed and watered. Her input will be sorely missed but we can still look forward to meeting her at events where she can bring her little Morris and relax and enjoy it. Liz will be a hard act to follow but the position is vacant if you want the challenge. Liz has also attached some photos of past Club events that will surely bring back some memories. I have decided to put my biro away and close down my computer as far as SWTVC business is concerned and am looking forward to going to rallies in my Morris rather than filling my Rav 4 with BBQ equipment – rolls – cans of drink – folding tables – paper cups – table cloths – signs – plastic bins – folding chairs – first aid equipment – prizes -( at times traffic cones !! ) etc etc and I will not miss the sleepless nights worrying about how many cars would turn up to events and if there would be enough food !! I loved organising the huge Autojumble we used to run years ago – sadly internet shopping put paid to that amazing event ! 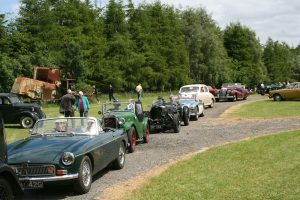 Looking through my photographs over the years I felt quite sad – we used to have 30/40 cars at the annual June Rally. I spent weeks before getting permission from the various councils and the Police to hold the Rally and many long suffering members were persuaded to man the various check points where they stood in all weathers and signed the time sheets !!! I came across this photo of my granddaughter Millie in my Morris ….. she is now 14 years old !!!! maybe it was telling me something !!!! I am grateful to Roger Martin who has responded to my request for information on the history of our cars. 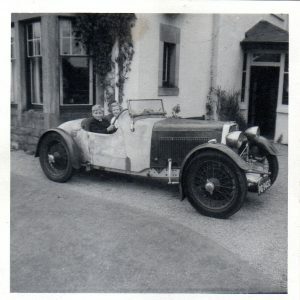 He has sent an interesting account of his Aston Martin and how it was rescued from a scrapyard in Milngavie. 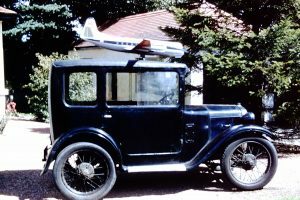 This includes amusing asides such as a picture of an Austin 7 with a large model aircraft strapped to the roof. This car, the 41st International built since the start of the production run in 1927 and the 105th Aston ever built, was first registered on the 3rd of June 1930 by Surrey County Council to a Mr S.F. Seyfried of London according to the works card held by the Aston Martin Heritage Trust (AMHT). 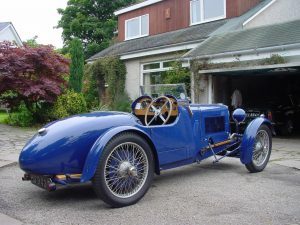 It was originally fitted with the standard 2/4 seater open body made by Enrico (Harry) Bertelli for the chassis built next door in the Feltham Works by his younger brother Augustus Cesare Bertelli (Bert). 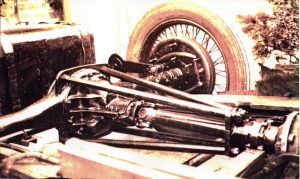 The Chassis, which is slung under the back axle at the rear to give a lower line, uses a 1½ litre single overhead camshaft engine designed by Renwick and Bertelli in 1926, a separate 4 speed straight cut gearbox driven through a Borg and Beck clutch with a clutch brake and originally driving a worm drive rear axle through a torque tube. The car sits on 21 inch wheels with 4.50 tyres covered by cycle wings attached to the brake back plates, thus the front wings turn with the wheels when they are steered. 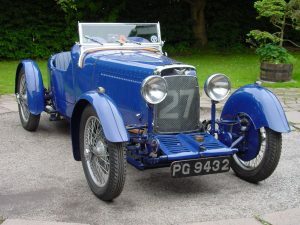 Research carried out by the Aston Martin Owner’s Club historian has established the current body was built and fitted by the factory in 1932. 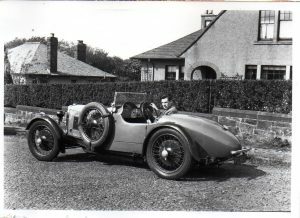 This research also identified a series of owners showing the car was brought to Glasgow in 1937 and subsequently moved to Edinburgh in 1948. I was interested to note that two of its previous owners lived in Park Terrace Glasgow very close to where I was born a few years later. One of the owners listed is J. G Fairman, could this be Jack G. Fairman the racing driver who drove for several prestigious teams including Aston Martin and partnered Stirling Moss to victory at Nurburgring in1959? In July 1949 it was sold for £200 to William A. Hunter who had a garage business in Edinburgh and who used it competitively as a member of the Lothian Car Club. At that time it had a grey body with black wings and the spare was mounted outside on the nearside. He won an award at the LCC Concourse at South Queensferry in that year. He also competed in race meetings at Winfield in the borders and in the last meeting to be held there, the worm drive back axle broke on the start line. Over the winter this was replaced by an ENV axle from another Aston, which had to be secured by a fabricated torque tube arrangement adding a considerable amount of weight and giving a higher back axle ratio. With the result that the following year, at the first race meeting at the ‘new’ Charterhall circuit, the little Aston came in last! In May 1955 it changed hands again and moved back west to Motherwell for a short time before returning to Glasgow in the possesion of a Mr. Carnie who crashed it into a lamp post bending the front axle. It was taken to a scrapyard in Milngavie and this could have been the end of the story but it was spotted by a young enthusiast who bought it and set about repairing it with his friend. The axle was straightened by Bramber Engineering who straightened and reassembled it for £5.00! shared interest in aero modelling. I attended club meetings in my Austin 7 with my large Viscount model aircraft strapped to the roof. Learning of my interest in old cars they offered me the car for £30.00 but I was only 19 and my mechanical skills had only just been honed on the Austin. I thought the Aston would be beyond my capabilities and declined the offer. At this point fate intervened: the construction of the M8 meant the stable would be demolished. Disposal of the Aston became more pressing and I managed to negotiate a better deal. I was pretty impressed with the performance of my purchase but did not realise what it was till I joined the AMOC and got some literature from them, including a reprint of a 1929 road test from ‘The Motor’. Then, on the way back from Edinburgh, a con rod broke and knock a hole in each side of the block! S42 as she is ‘today’, actually she is in bits again as I am rebuilding the axles and gearbox. Roger M Martin. 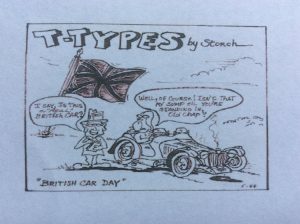 And finally, this cartoon has been borrowed from an Australian Car Club magazine also sent to me by Roger. It’s quite fun to have a little fun poked at us from time to time but I am sure British cars of the period were no more incontinent than those from further afield.